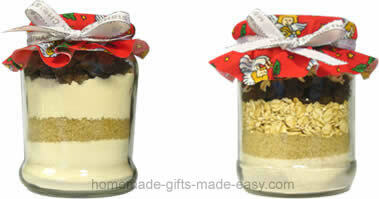 Cookies in a jar recipe are a delicious, versatile, and inexpensive gift idea. 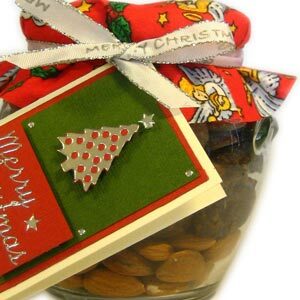 They are quick to prepare, and you can make large batches to prepare several gifts at the same time. So if you are short on time, look no further than these layered recipes! One of the most guaranteed-to-please cookie recipes in a jar! Its certainly a real winner with my family. Make sure you cook a batch up for yourself too. They are nice and crunchy at the edges, and soft in the middle - yum! To fill 1 quart (1 L) jar. Makes approx 3 dozen cookies. 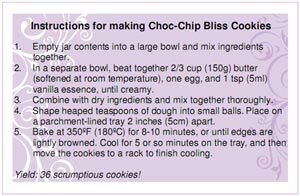 Variations: Reduce the quantity of chocolate chips by half, and add 3/4 cup (roughly 120g) of chopped walnuts, macadamias, or hazelnuts. Mix together flour, baking soda, salt, and white sugar (I'll call this the flour mix). 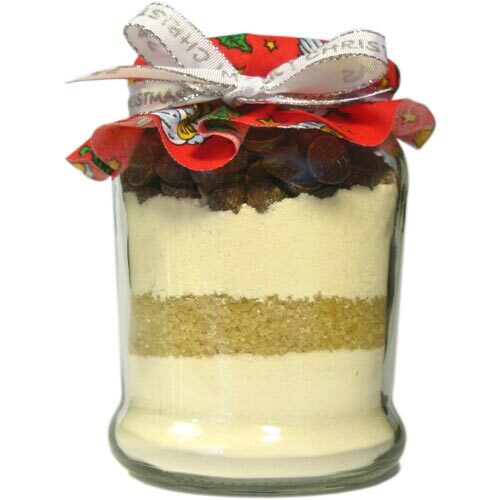 Add ingredients to your jar in the following order: flour mix, brown sugar, flour mix, chocolate chips. 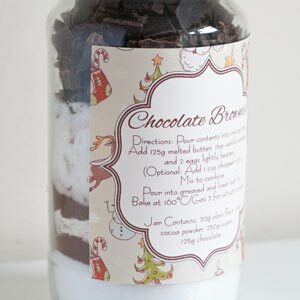 Gently tap down your jar after the addition of each layer to flatten the layer out. Decorate your jar with a scrap of fabric (you can trace a circle of fabric out neatly by using an upturned breakfast bowl), a pretty ribbon, and attach the instructions below. 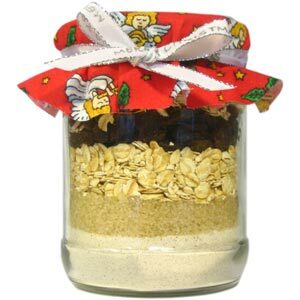 Storage: so long as the jar is air-tight, the cookie mix will last as long as any of the individual ingredients (just look on the packaging), which is normally a couple of months. Put these instructions on the jar or in the accompanying card. You could write out the instructions on a nice gift card, or print out my printable label , pictured below. Empty jar contents into a large bowl and mix ingredients together. In a separate bowl, beat together &frac23; cup (150g) butter (softened at room temperature), one egg, and 1 tsp (5 mL) vanilla essence, until creamy. Combine with dry ingredients and mix together thoroughly. Shape heaped teaspoons of dough into small balls. 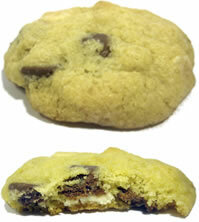 Place on a parchment-lined tray 2 inches (5 cm) apart. Bake at 350 °F (180 °C) for 8-10 minutes, or until edges are lightly browned. Cool for 5 or so minutes on the cookie tray, then move the cookies to a rack to finish cooling. Or check out my full list of recipes. Yum!